I am suffering from my third stomach ailment this year. After two days of being laid up, my fever had broken and my energy was back. But a ten-hour workday, punctuated by kale salad, farro, beets and Brussels sprouts put me in my place. I woke out of a dead sleep at 4am and went to retrieve the recycling bin that had been my constant companion earlier in the week. Somehow I managed to dress for work and get as far as my subway stop before giving up and returning home. On the way I stopped off at the grocery store for an array of easily digestible (mainly white) foods. Breakfast was plain white toast. For lunch, I moved on to a small banana and a can of Coke (a concession to my caffeine addiction). By 7:00pm, I was actually experiencing something that resembled hunger, but suspected I still needed to tread lightly. I’ve made this soup before in various forms. The ginger is great for stomach ailments and clearing the sinuses. It cooks up in under half an hour and, if you’re feeling a little less peaked than I am at the moment, you can doctor it in all kinds of ways. Even the most basic version is a welcome flavor boost after white bread and bananas. Add the first four ingredients to a small pot, bring to a boil and reduce to a very low simmer. Add the chicken and simmer gently until just cooked through (7-10 minutes). Remove chicken. Add the rice and continue to simmer for 15 minutes or until tender. Meanwhile, shred your chicken using two forks. 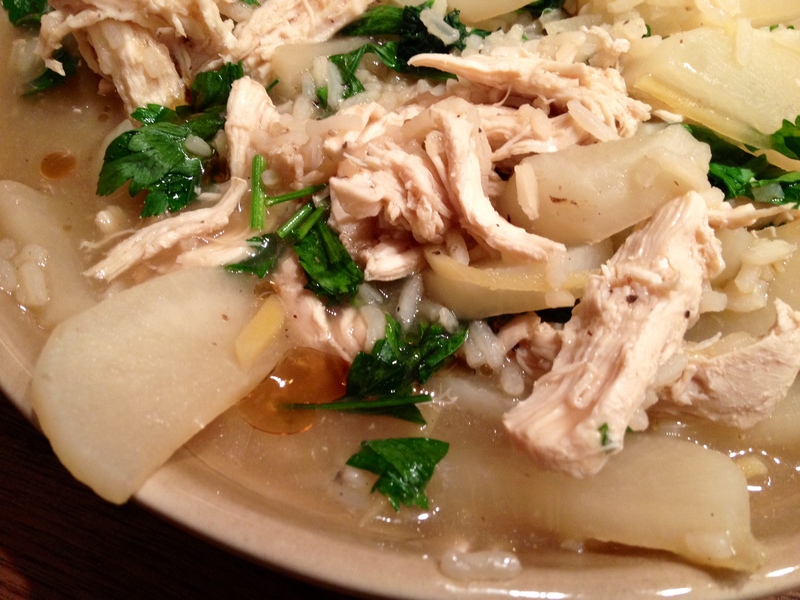 When the rice is cooked, slide the chicken back in and simmer another minute or two. The above makes a lovely, restorative soup. If you want to take it a step or two further, at this point you could do any or all of the following 1) swap rice noodles or egg noodles for the rice (and adjust the cooking time accordingly), 2) add spinach leaves and simmer until just wilted, 3) stir in a lightly mixed egg, 4) garnish with thinly sliced scallions or chives, 5) stir in a shot of Sriracha, 6) drizzle with a little toasted sesame oil, 7) sprinkle with cilantro leaves before serving. UPDATE: The chicken breasts came three to a pack, so I continued the theme throughout the week. Here’s a version with daikon radish, turnip, parsley and sesame oil that I made the next day, once my stomach had started to recover. The parsley was a sorry substitute for cilantro, but this iteration was otherwise delicious. 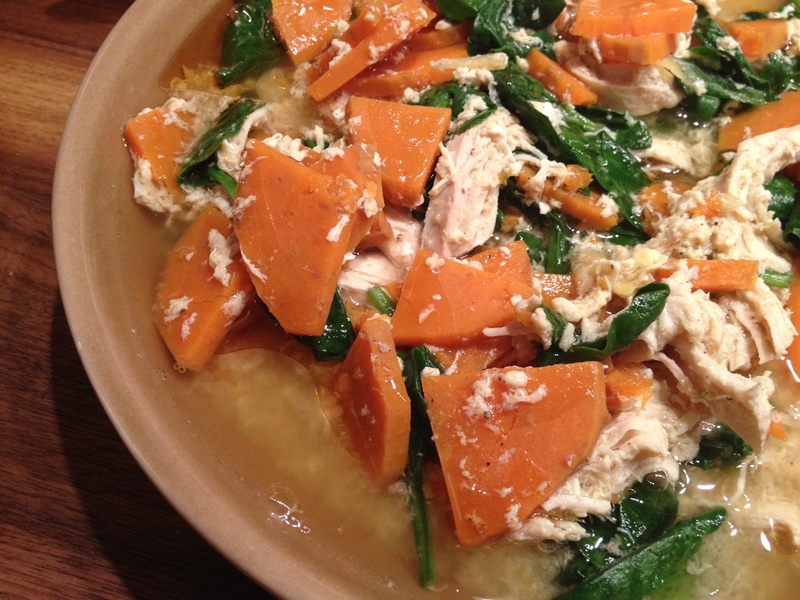 A few days later, when the craving for fiber and complex carbohydrates had kicked in, I swapped the rice for a thinly sliced sweet potato and stirred a bunch of baby spinach and a lightly whisked egg in at the last minute. This was a very nice reentry into my normal food patterns. I’m coming off of back-to-back 60-hour workweeks. In the middle of it all, I threw my back out necessitating a trip to urgent care and a cocktail of controlled substances that I’ve had to meter our carefully so as to remain functional for Tuesday’s fundraising gala and its aftermath. By Saturday I was off duty and officially on Spring Break. I celebrated by purchasing a bottle of Bulleit Bourbon for my train ride down to Baltimore. That plus some Percocet and a little Zeppelin momentarily had me pain-free for the first time in over a week. The plan was (and, I think, still is) a road trip down to Nahunta, Georgia to pick up a grill (well, technically a smoker cooker) that the good folk at Lang BBQ Smokers are building to spec for my friend Don. Between my back problems, a death in Don’s family, and a freak mid-March snowstorm over the mid-Atlantic, we’re getting a slow start. Don flew home from Wisconsin last night via Atlanta (which, incidentally, put him within a four-hour drive of his new grill). His father-in-law had passed away in the wee hours of the morning and he’d had an arduous daylong journey, so I had resolved to cook him a nice meal. My instructions were to make something low in cholesterol and high in fiber, as Don had to swing by the lab for some blood work before we left town. Rooting through the pantry, I found some black lentils and long-grain pecan rice. The hanging basket under the stairs held an onion and a large sweet potato. In the back of the fridge were parsley and a knob of fresh ginger. This plus an ample spice cabinet would make for a warm, flavorful meal and provide us both with enough fiber to kick off five days of barbeque for breakfast, lunch and dinner. Bring the lentils and water/stock to boil in a medium pot, reduce heat, and let simmer for 25 minutes or until tender but still toothsome, seasoning with salt as needed. If you’re making rice to accompany the dish, now is a good time to start that process. Strain the lentils, reserving the cooking liquid. Add oil to your pot and bring up to medium heat. Add the onions and stir frequently until softened and starting to brown. Add ginger and stir constantly for one minute. Add all of the spices, stirring constantly for another minute. Add the reserved cooking liquid and the sweet potato. Simmer until potato has softened, adding water if the mixture gets too thick. Pour the lentils back into the pan along with the vinegar and a good dose of freshly ground pepper. Let simmer for a few more minutes, taste and adjust seasoning as needed. Add fresh herbs off the heat. This recipe makes about four servings. I reheated the leftovers for breakfast. Don had his with rice. I simmered an egg in mine. Imagine this should get us through the first few hours of our snowy spring break road trip. 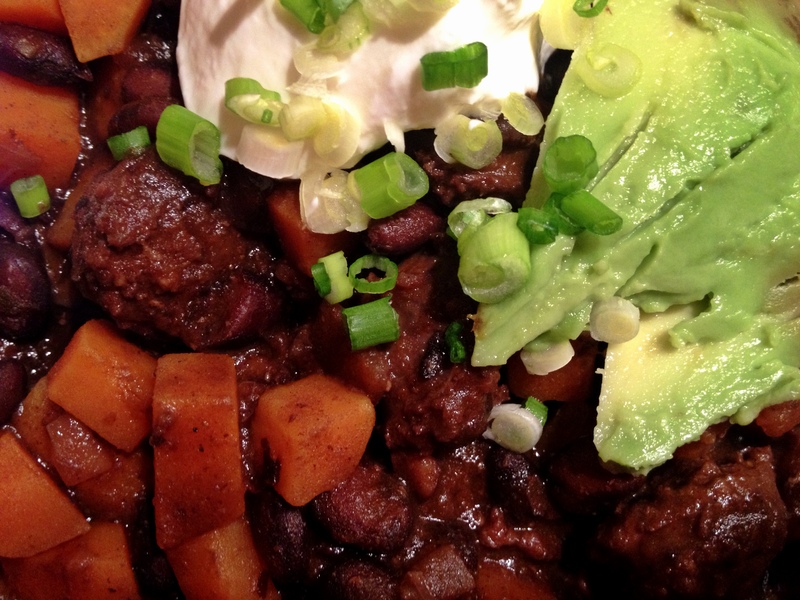 This post contains two recipes which, when combined, yield a very nice pot of chili for four. 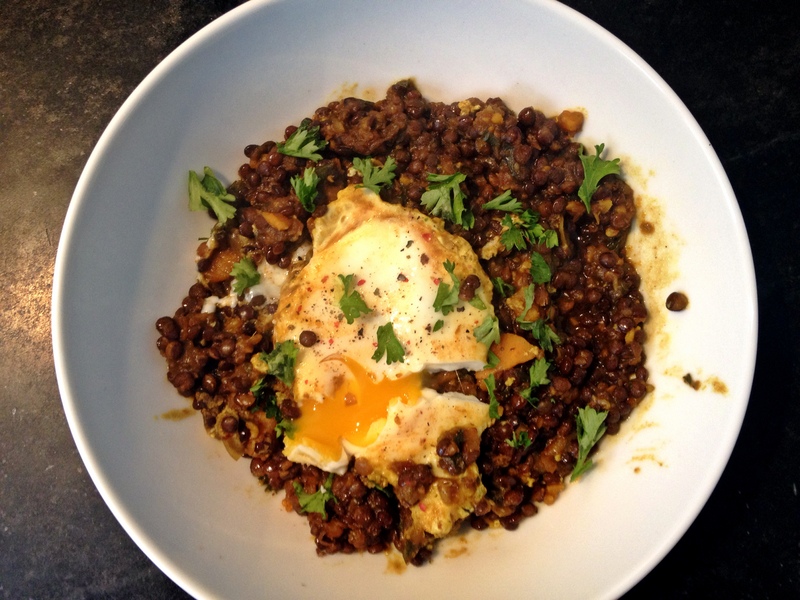 I recommend doubling the bean recipe and setting half aside so that you can throw together quick dinners of tacos, huevos ranchers and the like throughout the week. Add the beans to a large pot along with enough water to cover them by a few inches. Bring to a boil, turn off the heat and let them sit for an hour or more. Add the pork fat, onions, garlic, bay leaf and oregano. Bring back to a boil, reduce heat and let simmer for one hour. Add the whole peppers and salt and pepper to taste. Let simmer for another 30-60 minutes until the beans are quite soft and the cooking liquid has thickened. Remove bay leaf and chilis, transfer beans and cooking liquid to another container, give the pot a quick rinse, and move on to the next recipe. Bring the oil up to medium heat in a large pot. Fry your sausage slices in two batches, allowing them to brown and crisp in places. Remove the sausage, lower the heat a bit and add your onions. (If there wasn’t much fat left from your sausage, you could add a little more olive oil at this point.) Saute until starting to soften, then add in the spices and cook stirring constantly for one minute. Do the same with the tomato paste. Dump your reserved beans and sausage into the pot along with the cider vinegar and enough water that everything is just submerged. Let simmer for 30 minutes, then add the sweet potatoes. Let simmer for another hour. 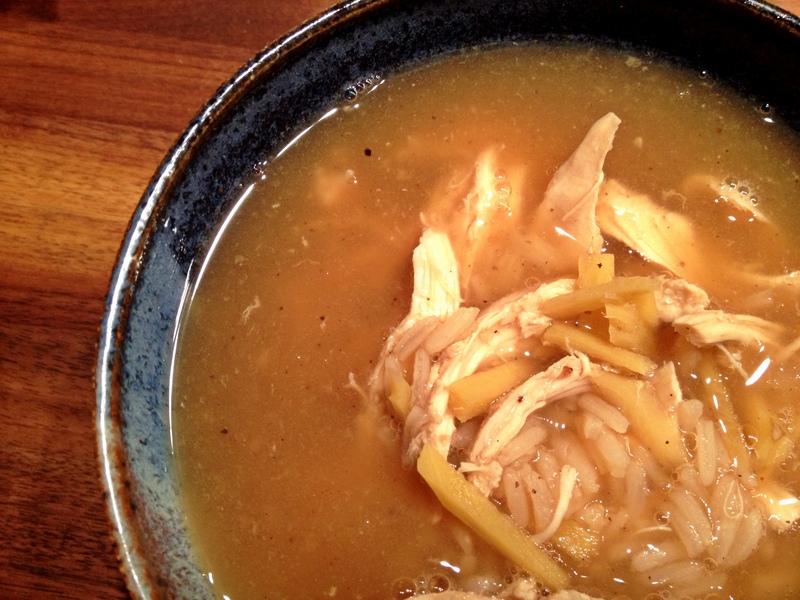 You can add water as you go if needed, but the goal is more of a thick sauce than a broth. Taste and adjust seasoning with salt and pepper if needed. I served this garnished with thinly sliced scallions, avocado slices and some Greek yogurt to counterbalance all of that heat. As any regular reader will have intuited, I have a deep and abiding affection for leafy greens–the darker, the better. The winter months can be rough for green lovers who live in northern climates, but hearty collard greens seem to fare well. They also hold up nicely in the refrigerator, unlike some of their more delicate relations. 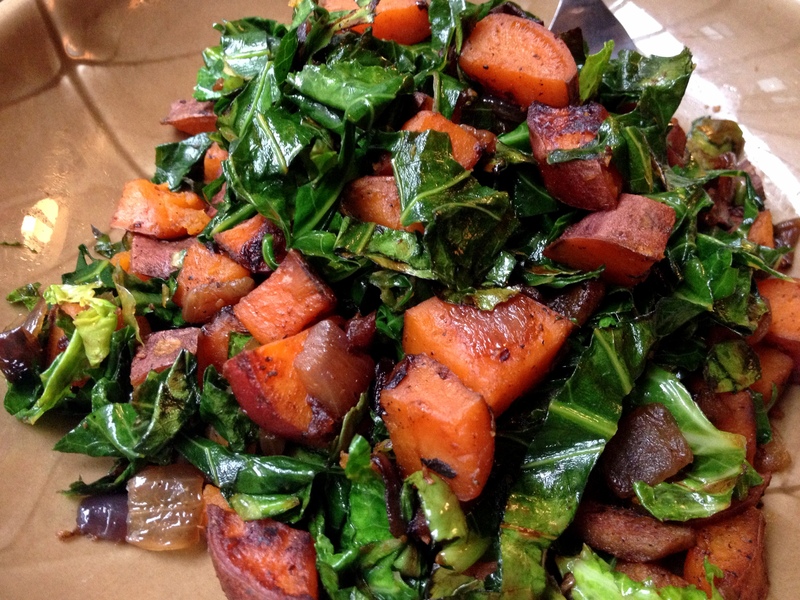 Collards are a traditional New Year’s food throughout the American South. 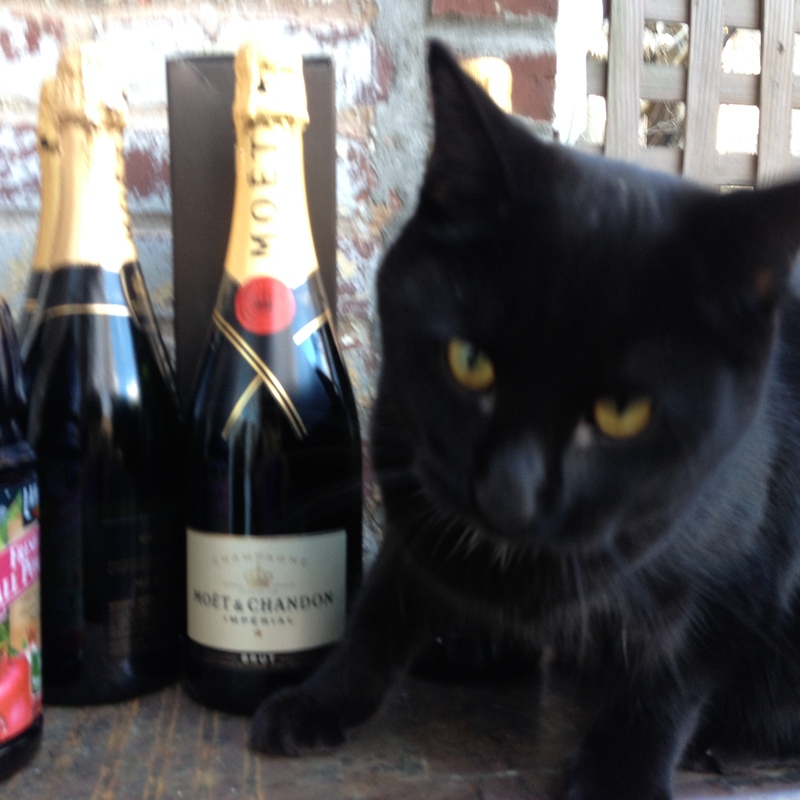 I rang in the new year with good friends and cuddly cats in Baltimore. 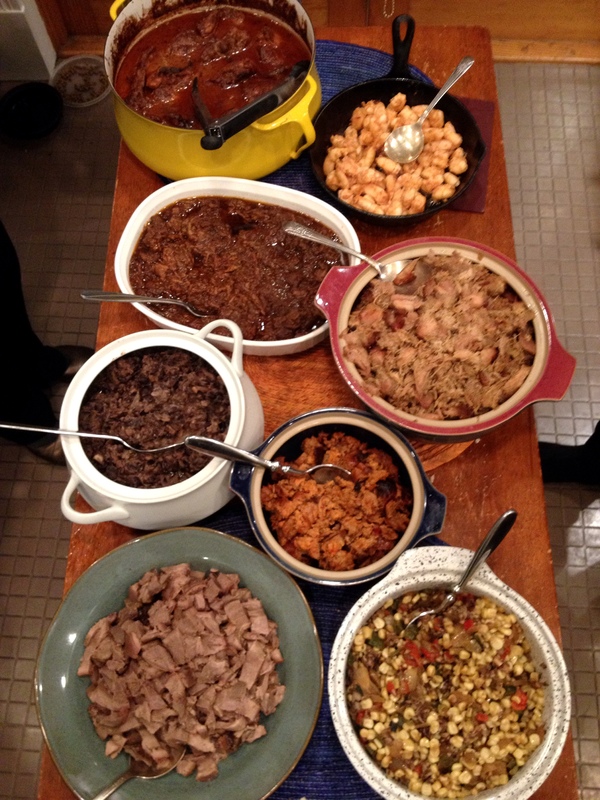 The 20 or so guests were no match for the truly insane variety of taco fixings that were on offer. Homemade corn tortillas swaddled red chicken mole, grilled gulf shrimp, carnitas, chorizo, mushroom and corn rajas, pickled cow’s tongue, refried beans, Coca-Cola braised beef, and black mole goat (not pictured, because it was simmering away in the crockpot). There was a whole other table of salsas, cheese, veggies and the like. 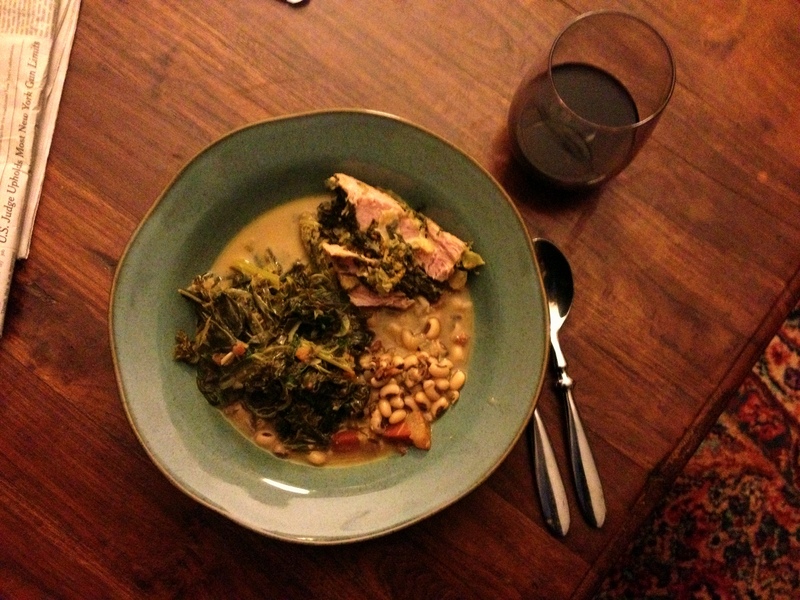 New Year’s Day found us watching a trashy movie while dining on stuffed ham, black-eyed peas, and collard greens braised in coconut milk with some black cardamom I’d picked up at Union Market while passing through Washington, DC. I used this recipe from Serious Eats as a starting point for what turned out to be a damn tasty variation on a classic dish. It is January 5th and I’m on a bit of a collard bender. Thursday morning, I poached an egg in some of the leftover greens before hopping a train back to NYC just ahead of a snowstorm. Friday I bundled up to check out the winter wonderland and get some more greens, which I sautéed with soy sausage. 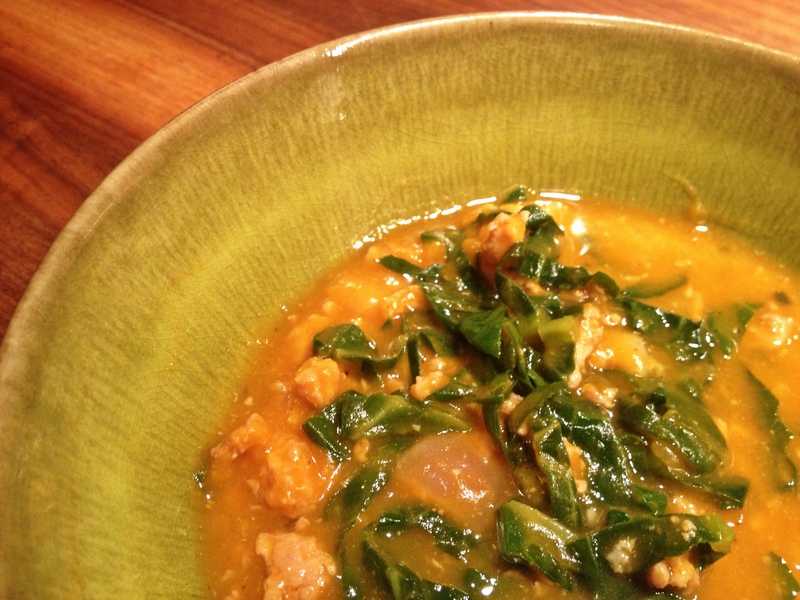 Yesterday I ate the collards braised with roasted delicata squash and red onion. Bring a large cast iron skillet up to medium-low heat and add the bacon, stirring frequently until it begins to release its fat. Add the onion and continue stirring frequently until softened. Add salt, pepper and chipotle powder. Stir the collards in, ensuring that they are coated in oil. Pop the lid back on and let them steam for a few minutes. Finish with the lid off, allowing any excess liquid to boil off. 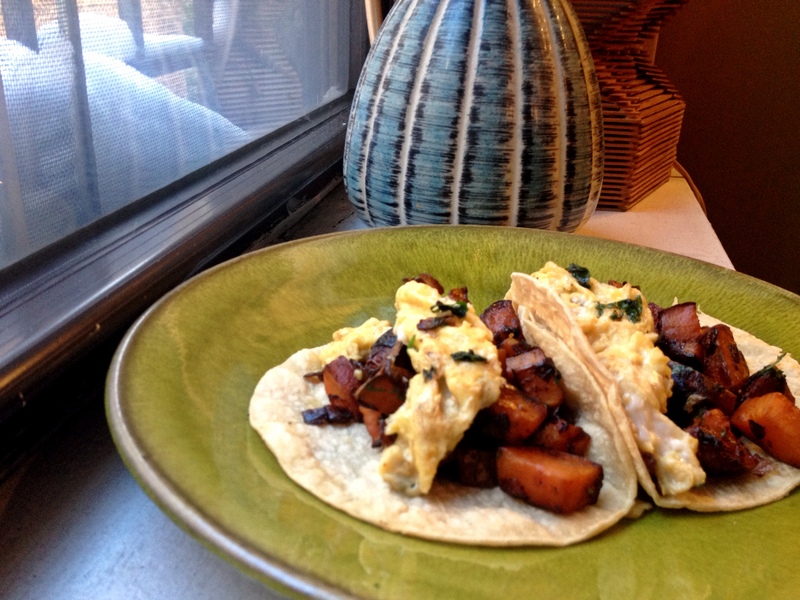 Red onion and sweet potato hash with chipotle powder topped with scrambled eggs and swaddled in corn tortillas will keep you warm when the snow is piled up and temperatures are in the single digits. It will not, however, do anything about the lack of hot water when you need to take a shower. I am still working my way through the last of this season’s CSA share. Olive oil, habanero powder, salt and pepper are the only things in this dairy-free bisque that didn’t come directly from Windflower Farm or a nearby meat purveyor. This came out crazy tasty, which is a good thing since I will be eating it all week. Preheat oven to 425. Peel the sweet potatoes and cut them into large hunks of roughly the same size. Place on a cookie sheet and mix with 2 tablespoons olive oil plus some salt and pepper. Pop these in the oven and cook until soft and starting to brown, approximately 15 minutes. Bring two tablespoons of olive oil up to medium heat in a large, heavy-bottomed pot. Chop the onion, add to the pot and sauté until soft. Press and add the garlic along with the habanero powder, adding more if you like things really spicy. (I used a heaping teaspoon and mine came out pretty damn hot.) Stir constantly for one minute. Then add the ground turkey. Cook, stirring occasionally, until all pink is gone. Season with salt and pepper. Puree the sweet potatoes, using water as needed to loosen the mixture. Add the purée plus the chicken stock, water and apple cider to your turkey mixture and bring to a boil. Lower heat and simmer for 30 minutes or so. Taste and adjust seasoning with salt and pepper. Strip the stems from your collards, roll them like a cigar and thinly slice into strips. Add these to the pot and simmer for another 10-15 minutes.